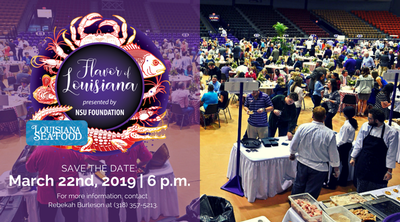 President Chris and First Lady Jennifer Maggio invite you to the Flavor of Louisiana, a spring fundraiser & seafood extravaganza that celebrates our donors, supporters, alumni and students at Northwestern State University. The Louisiana Seafood Board has graciously partnered with the NSU Foundation on this event which allows us to showcase specialty dishes from some of the greatest restaurants across Louisiana. Special guest will be Lt. Governor Billy Nungesser. The Flavor of Louisiana will begin at 6 p.m. with music, cocktails, and specialty dishes at Northwestern State University’s Prather Coliseum. In conjunction with this event, the six colleges at NSU will be hosting their very own fundraising booths that will assist in raising money for each of the colleges. This event is hosted by the NSU Foundation and the Louisiana Seafood Board. All proceeds go to support the NSU faculty, staff, programs, and scholarships. For more information contact the Office of University Advancement at (318) 357-4414.